Questions concerning LXDE themes, interface design, posters, logos and images. If you would like to help with design related tasks of LXDE, please join the Design Project and subscribe to the design mailing list. 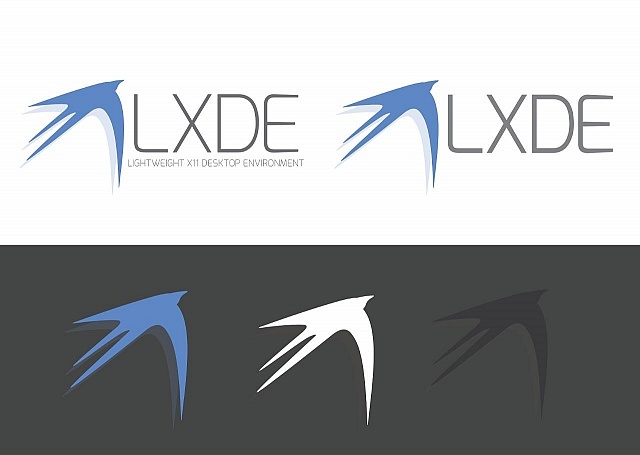 Anyway I have designed a new logo for LXDE, I've seen many suggestions already. To future proof the design and make it modern, instead of going completely off topic, a position change with a bit of depth with a layer and type is all that's necessary to make this logo beautiful and of higher quality compared to KDE, Gnome 3 and XFCE. Something best served in colour, but equally fine in black and white, and greyscale. I am not sure how to get this proposed as the official logo, but I would love to contribute properly, but I think the mailing list is down atm? Welcome to the LXDE forums. I have deleted your email address for your protection. Developers rarely if ever visit these forums. I just checked https://sourceforge.net/projects/lxde/lists/lxde-list and https://sourceforge.net/projects/lxde/lists/lxde-list and both seem to be operational. Recommend that you try again. that looks really nice, but i must admit i never really liked the swallow. too pointy, doesn't look good in small sizes. mayeb you can come up with some new shape altogether.